If you need one more reason to despise the college football bowl system  as if depriving fans of a real playoff to determine a true national champion isn't enough  check out the salaries of bowl CEOs. While universities and athletic departments across the country have had to slash budgets  even entire sports  because of the harsh economy, bowl directors are earning more than $300,000 for games that last all of four hours, tops. These are games, such as the Chick-fil-A Bowl, that don't help decide a national champion. Crowning college football's king is still done by the hated Bowl Championship Series (BCS), the system that relies on a confounding mix of human voting and fuzzy computer math to determine which two teams will play for the college football national championship. Fans have clamored for a playoff forever. But the intensity has picked up so much that last year the BCS hired Ari Fleischer, whose job it once was to defend the policies of President George W. Bush, to stand up for the current setup. Think it was hard defending FEMA? Try vouching for the importance of the GoDaddy.com Bowl or the Little Caesars Pizza Bowl. These games are nothing more than exhibitions. A new book, and a report from a political action committee that's trying to change college football, has tied together the college bowl system and excessive executive pay to give us all more reason to be irked. The book, Death to The BCS  which, despite its hyperbolic title, offers the most thoroughly researched, reasoned, and readable argument for a college football playoff to date  digs into federal tax records and says that in 2007, nearly two dozen bowl directors earned more than $300,000 a year. Many bowl organizations are non-profit entities. "The fabulous salaries of bowl directors was a surprise," says Dan Wetzel, the national columnist for Yahoo! Sports who, along with Josh Peter and Jeff Passan, co-authored the book. "But it perfectly explained why we now may use losing teams to fill the 35 bowl games. Everyone wants a payday like that." It's not just the executives of the most prominent games, like the Fiesta Bowl, the Sugar Bowl, and the Orange Bowl, who are raking it in. Death to the BCS points out that Rick Baker, the executive director for the Cotton Bowl, made $490,433 in 2007. Derrick Fox, who runs the Alamo Bowl in San Antonio, a lower-tier event, took in $438,044. The head of an even more obscure game, the Kraft Fight Hunger Bowl, took in $320,492 in fiscal 2008. That amounted to 11% of the game's revenue, according to the book. If the CEO of a for-profit company like Walmart got 11% of the revenues, he'd be making $44 billion (according to forbes.com, Walmart CEO Mike Duke will earn $19.2 million in total compensation in 2010, or .005% of the company's revenues). A recent report from the Playoff PAC, a Washington-based BCS-opposition group supported by some members of Congress, puts CEO pay in some additional perspective. John Junker, CEO of the Fiesta Bowl, made $592,418 in total compensation in fiscal 2009, while Paul Hoolahan, who runs the Sugar Bowl, got $645,386. 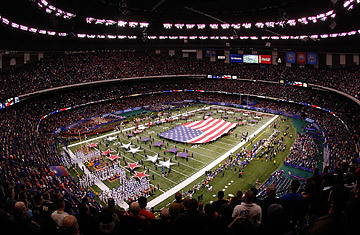 The report, entitled "Public Dollars Serving Private Interests: Tax Irregularities Of Bowl Championship Series Organizations," cites a compensation survey from the NonProfit Times; while Junker and Hoolahan made north of a half million dollars, non-profits with budgets comparable to the Fiesta and Sugar Bowls  between $10 and $24 million  pay their CEOs, on average, $185,270. The highest-paid non-profit CEO in this comparison group made $383,500. A 2009 study from Charity Navigator found that organizations almost six times larger than the Fiesta and Sugar Bowls paid their CEOS, on average, $462,037  still less than the guys in charge of a football game. As Death to the BCS points out, while the CEO of the Sugar Bowl earns nearly $650,000, the executive director of a non-profit of more import, the New Orleans chapter of Habitat of Humanity, earns $95,000. TIME asked to speak to the directors of five bowls  the Sugar, Fiesta, Cotton, Alamo, and Kraft Fight Hunger  in order to get a sense of what they do to earn that money. Only one, Kraft Fight Hunger Bowl executive director Gary Cavalli, agreed to an interview, through email. The Cotton Bowl directed TIME to its tax consultant, Bruce Bernstien, who explained that the compensation of a non-profit bowl CEO would not violate any tax laws if it falls in line with that of similar organizations. The only non-profits most similar to bowl games, however, are other bowl games. So as long as all bowl CEOs are making tons of money, everything is legal. See the top 10 NCAA upsets.